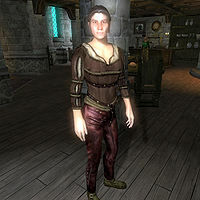 Else God-Hater is a Nord spellsword and a resident at the West Weald Inn in Skingrad. She is strongly antipathetic towards worship of the Nine Divines; so much so, in fact, that she serves as a Sleeper Agent for the Mythic Dawn and will go "live" once the player finishes the Dagon Shrine quest. Else doesn't do much in life, as she never leaves the inn and spends the entire day strolling around on both the ground floor and the second floor, sometimes chatting with the other residents. At 10pm she sits down for a late dinner, before going to bed at 1am for six hours of sleep. She's armed with a steel shortsword and her wardrobe consists of a brown shirt, a pair of buckled shoes and laced leather pants. She carries a few gold coins. Her room is located at the 3rd floor, the first door on the right, and in there, a copy of the destruction skill book Mythic Dawn Commentaries 2 can be found lying on a desk. Else is more than willing to converse on the subject of the Nine Divines - even when you approach her for the first time; "I'm Else God-Hater. Yes. I hate the gods. All gods. They can all bite my garters. And if you don't like it, YOU can bite my garters, too." When you ask her about Skingrad, she will say "Ask me what I think about chapels, praying, the Nine Divines. Go ahead. Ask me." and give you two opportunities. If you tell her that you don't care, she will respond like this; "Well. Good. I really don't care, either. I just get sick of all the god-talk. Might as well pray to rocks and lamp posts." If you choose to ask her, what she actually thinks, she will say "The gods don't do a damn thing. Do they even exist? How could anyone tell? Daedra Lords, sure. They exist. They do things. Bad things, mostly, but things you can see. The gods? They don't do a damn thing. So why do we build big chapels and sit around and mumble, and ask them to save us from this and that? It's stupid. And chapels and priests and folks groveling on their knees, they're stupid, too." She also has a thing or two to tell you about the town's eccentric Wood Elf Glarthir; "He's a raving lunatic. I'm assuming you're asking because he's done something strange. Like what? Oh, like shouting obscenities at you, or wearing only fur for an entire year, or waiting outside your house every morning. Not that you'll get anyone else in town to admit it. "Oh, he's harmless, we're used to him." Harmless, ha! One day he'll snap. Then watch out." She seems to be quite a renowned swordsman, as the townsfolk will often talk of her skills with a blade with comments such as: "That Else God-Hater sure has a chip on her shoulder. Great with a blade, but she really holds a grudge against the church. ", "Don't bring up religion around Else God-Hater. She's likely to use that sword of hers on you." and "Religion is definitely not a topic to bring up around Else. Swords, on the other hand, she'll talk about." As well as her skill with blades, Else has a good range of magic at her disposal. She can cast a major alteration spell, two major destruction spells, an illusion spell, a major restoration spell and can summon a minor daedra as well as her bound Mythic Dawn armor and sword. Else is one of the few Mythic dawn agents in the game to use the Mythic Dawn bound armor and sword spell, the only other being Raven Camoran; all other agents will use the Mythic Dawn bound armor and mace spell instead. For some reason, Else can sometimes be found sharing a room with the other resident Graklak gro-Buglump. As with almost all Mythic Dawn agents, if you have not killed Else by the time you finish Light the Dragonfires, she will no longer be hostile towards you. This page was last modified on 22 June 2018, at 04:26.